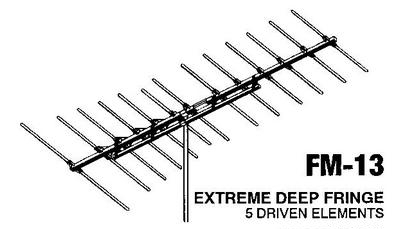 The Antennacraft FM13 is a log-Yagi array with 13 elements on a 137″ boom. Five of the elements are driven. A review is here. This shows segmentation detail for the phasing lines and feedpoint. I jumpered a wire across the feedpoint terminals and placed a source at its center. Blue dots mark analysis segments. The red dot is the feedpoint.